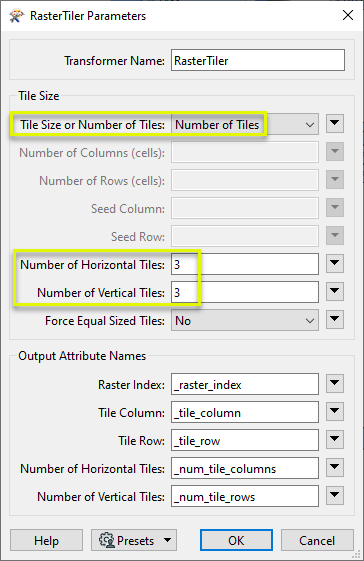 Splits each input raster into a series of tiles by specifying either a tile size in cells/pixels or the number of tiles. The RasterTiler accepts raster features, and divides them into smaller tiles according to the parameter selections. Tile size can be defined by specifying tile dimensions in cells/pixels, or by specifying the number of tiles to create, both vertically and horizontally. In either case, the tiles are measured from the upper-left origin (0,0) position. If tiling by Tile Size, the origin can be offset (Seed Column and Seed Row). 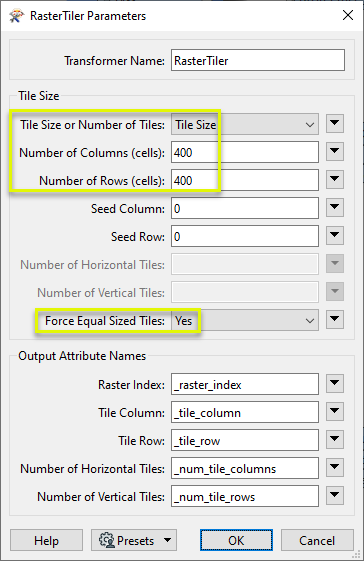 If the specified tile size results in partial (smaller) tiles along the right or lower edge, the Force Equal Sized Tiles option can pad smaller tiles with cells to match the full tile size. Attributes may be added to the output tiled raster features, including an original raster index, row and column positions, and tile counts. This transformer is unaffected by raster band and palette selection. In this example, we will tile a single orthophoto, by Tile Size. Note that the original image is 1600 by 1000 pixels. The raster is routed into a RasterTiler. In the parameters dialog, we choose Tile Size, and set the size to 400 by 400 cells (pixels). This will produce four tiles across, exactly divided into the original 1600 pixels in width. It will produce three tiles vertically, but the lowest row will be partial (400 does not divide into 1000 equally). By turning on Force Equal Sized Tiles (Yes), the lowest row will be padded to produce full size tiles. Twelve tiles are output, as shown here with their extents overlaid in pink. Note the new attributes which indicate the source raster, the number of rows and columns produced by the tiling operation, and this raster’s position. Row and column counts start from zero (0). The lowest row has been padded with empty cells to match the defined tile size. In this example, we will tile a single orthophoto, using Number of Tiles. Note that the original image is 1600 by 1000 pixels. In the parameters dialog, we choose Number of Tiles and set both the horizontal and vertical number to 3. Nine tiles are output, shown here with their extents overlaid in yellow. The tile size is determined by dividing the dimensions of the original raster by the defined number of horizontal and vertical tiles. When the division of number of tiles into the dimension produces partial cells/pixels, the number will be rounded up. In this case, 1600 width divided by 3 tiles = 533.33. The tiles are created as 534, 534, 532. If we had turned on Force Equal Sized Tiles, two columns of blank cells would be padded on the right-hand tiles. Note the new attributes which indicate the source raster, the number of rows and columns produced by the tiling operation, and this raster’s position. Row and column counts start from zero (0). The tiles produced according to the parameter selections. Non-raster features will be routed to the <Rejected> port, as well as invalid rasters. Number of Columns (cells) If tiling by Tile Size, the number of cells (pixels) to include in each tile horizontally. Must be greater than 0. Number of Rows (cells) If tiling by Tile Size, the number of cells (pixels) to include in each tile vertically. Must be greater than 0. Seed Column If tiling by Tile Size, specify the starting location to start tiling. Default is (0,0) - (Seed Column, Seed Row) - which is the upper-left corner of the raster. Seed Row If tiling by Tile Size, specify the starting location to start tiling. Default is (0,0) - (Seed Column, Seed Row) - which is the upper-left corner of the raster. Number of Horizontal Tiles If tiling by Number of Tiles, the desired number of tiles to be created horizontally. Must be an integer greater than 0. Number of Vertical Tiles If tiling by Number of Tiles, the desired number of tiles to be created vertically. Must be an integer greater than 0. Controls behavior when the raster size is not a multiple of the requested tile size or number of tiles. No: Tiles on the right or bottom edge of the raster may be smaller than other tiles. Yes: All tiles will be the same size. Tile extents that exceed the raster will be padded with the nodata value if one is set on the band; if no nodata value is set, RGB rasters will have an alpha band added to identify the padding regions. Name the attribute to be added to each output tile that identifies which raster it was created from. This index is zero-based, so all tiles created from the first input raster will have a value of 0, all tiles created from the second input raster will have a value of 1, and so on. Name the attribute to be added to each output tile that identifies that tile’s column position, starting from 0. Tile Column 0, Tile Row 0 corresponds to the upper-left tile. Name the attribute to be added to each output tile that identifies that tile’s row position, starting from 0. Number of Horizontal Tiles Attribute Name the attribute to be added to each output tile that records the total number of tiles produced horizontally by the tiling operation on the input raster. Number of Vertical Tiles Attribute Name the attribute to be added to each output tile that records the total number of tiles produced vertically by the tiling operation on the input raster. Search for all results about the RasterTiler on the FME Community.